Before marrying my fun, wonderful, affectionate, generous and kind husband, he told me he liked ocean cruises. I had never been on a cruise but I *blove* movies and books about ships and the sea-coast and anything to do with the ocean. I was captivated by “Blue Lagoon” and its sequel, watched all the “Horatio Hornblower” episodes and tried twice to read Swiss Family Robinson all because those stories involve ships and shipwrecks and the sea and shore. Since I was a kid, I’ve thought I’d like to take a cruise on a sailing ship. You know, the kind with canvas sails? They’re the sort that sway and lean, get becalmed without wind and sometimes sink in storms. There’s something dreamy and romantic about the thick ropes, sturdy wood deck, stretched canvas on tall masts, big wooden wheel and polished wood railings with brass fittings. 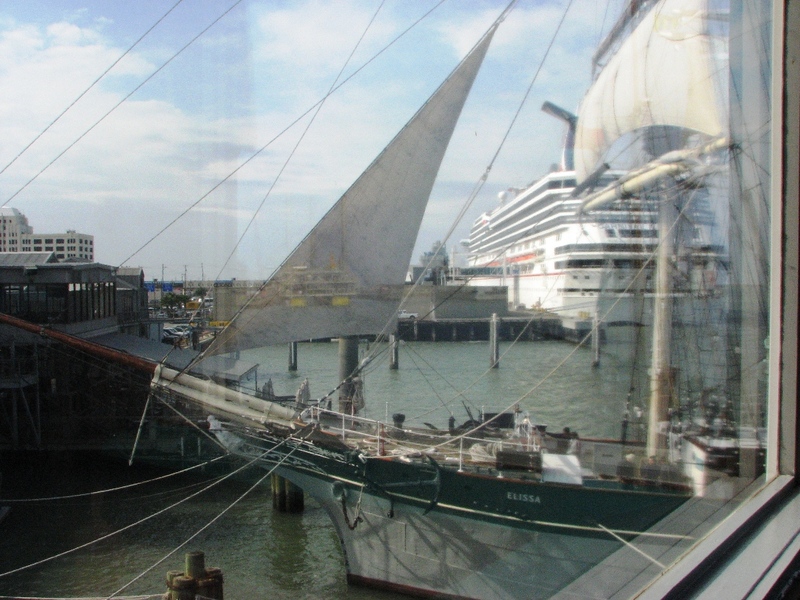 I once toured the Elissa, a tall sailing ship docked at Galveston. Never mind she was built in 1877 and should have retired fifty years ago, she’s a beautiful sailing ship, with a mammoth iron anchor, masts and canvas and hammocks and everything kept sea-worthy. Occasionally, I dream of taking passage on a ship just like her. There’s just one problem, or maybe two. One—I can’t swim, even after twice taking lessons from a professional. Two—I get sick on a fishing dock with movement so subtle most people don’t even feel it. I’m game for anything my honey proposes, so we cruised the Eastern Caribbean as soon as we got married and this year we saw highlights of the Yucatan peninsula, including Cozumel Island. We sailed, even if our ship didn’t have any canvas. I didn’t have to swim, though I was particularly attentive during the emergency drill, studied the disaster evac plan and checked out the life jackets in our stateroom. And I didn’t get seasick. I carried my Dramamine on board and never opened it. I did not enjoy the rolling of the ship but I guess I got used to it. The only time I found it worthy of negative comment was when seated at the dining table and when trying to walk down a long hallway to our cabin. Ship passengers learn an adaptive walk that includes a wider stance and flat-footed steps. Sideways stumbles are accepted as necessary to right oneself when the ship doesn’t go the direction one expects. Everyone is staggering as if slightly tipsy. It makes me feel a little foolish, which makes me giggle, which generally confirms the onlooker’s suspicion. We debarked (got off the ship) at several ports and I didn’t notice any difficulty getting my land legs back under me. Home now two days, though, I’m still doing the wobbly walk and still giggling. I’m starting to wonder if this might be a permanent effect of sailing without canvas. This entry was posted in Short Takes on Life and tagged beach, cabin, canvas, Elissa, mast, ocean, sailing, sea coast, seasick, ship, shipwreck, shore, Swiss Family Robinson, tall sailing ship, yucatan peninsula. Bookmark the permalink. I’d say you’ve got some kind of permanent vertigo happening if you were ‘captivated’ by the *second* “Blue Lagoon” movie. And you left out Tom Hanks and his buddy Wilson the Volleyball, but maybe that doesn’t count because his maroonedness was precipitated by a plane crash, not a ship. Ha-ha! Just captivated by the lagoon! And “Castaway” was in mind & in this piece until I edited for brevity. It does count ’cause he was surrounded by the ocean. You make my heart sing, faithful reader! Fun? Did I say anything fun? We’ll have to cover that subject later. 😀 Thanks for commenting!